Neato Botvac D80 Robot Vacuum for Pets. 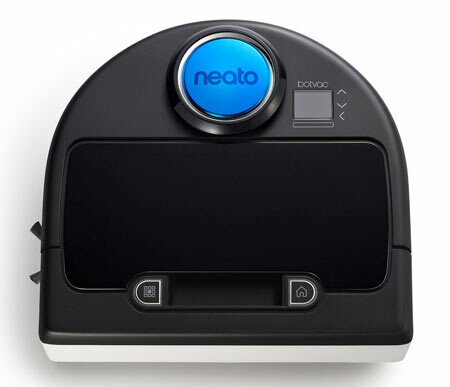 The Neato Botvac D80 is Neato’s lowest priced robot vacuum with daily scheduling. It is effective at getting dirt, dust, pet fur, and pet hair from a variety of surfaces using its SpinFlow Power Clean system which combines suction and precision brushes to leave floors immaculately clean. The D80 includes both combo brush, spiral blade brush, and side brush. This sophisticated robot vacuum uses LaserSmart Mapping and a navigation system to scan and map the room. As a multi-floor vacuum, this robotic vacuum will automatically adjust to clean carpets, hardwood, tile, and linoleum floors as it moves through your home. Roomba will vacuum every section of your floor multiple times, and its advanced software allows it to get around obstacles, move along walls and to avoid falling down stairs, drop-offs, and avoid tangles from loose cords. The Auto-Charge & Resume feature will automatically return the Botvac to base to charge, then resume cleaning. The extra large .7 liter dirt bin will hold more than most other robot vacuums. The Neato D80 starts working for you at the push of a button (on the top of the vacuum). Neato Design Features: The D-Shape design of all Neato Robot vacuums along with CornerClever technology will get you closer to walls and corners for better cleaning. (Most other robot vacuums are round). This will give the D80 Maximum hair and pet hair pickup. Multi-floor capability, for hard floors, hardwood, tile, linoleum, rugs, and carpets. Boundary markers keep the robot restricted to an area. Schedule cleaning while you are away. On-Board Scheduling: The Neato D80 can be scheduled to perform daily cleaning sessions even when you’re not home. Smart-Review Commentary: The Neato Botvac D80 is Neato’s lowest priced model currently available. As with all Neato robots, they are D-shaped to better handle walls and corners. Neato vacuums are extremely sophisticated cleaning machines, using the latest software and sensor technology to vacuum your entire floor, yet avoid obstacles. It will clean areas that vacuums rarely go, such as under furniture, under a bed, in corners. The Neato D80 is equipped to handle fibers like hair, pet hair, pet fur, lint and carpet fuzz. It is ideal for those with pets. The larger dust bin requires less emptying than previous models. This vacuum can do a comparable job to many uprights, because this vacuum goes over a dirty area many times, until clean. If this fits your lifestyle, it is an excellent robot vacuum to clean your rooms while you do other activities. Very simple operation, just press the clean button. You also have the option to schedule cleaning when you are not home with daily cleaning scheduling. If you are interested in a model that can be used with your smartphone, see the D3 and D5 connected models below. The D80 model has received very good reviews by consumers and is a Smart-Review top pick for robotic vacuums, and a good value. iRobot’s top rated 900 series model. 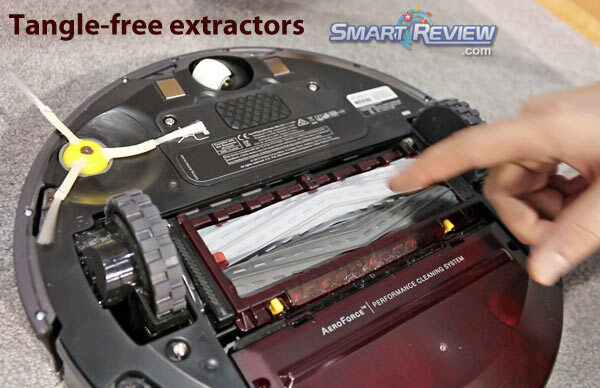 We saw the Tangle-Free extractors technology demonstrated at CES. 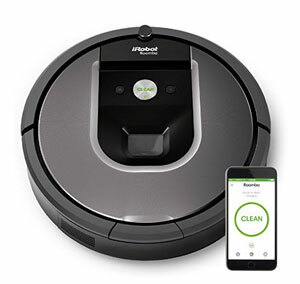 The 960 model comes with 1 Virtual Wall (to keep the robot in a specific room), Built-in Wifi, New AeroForce Tangle-Free Extractors, and upgraded lithium ion battery, giving an extended 75 minutes of cleaning. Recharge & Resume: robot returns to base, recharges, then resumes cleaning. The iRobot 960 Features: The new Tangle-Free AeroForce Extractors provides a 5X improvement in air power than previous Roomba generations. They eliminate the maintenance hassle of hair clogs and jams. 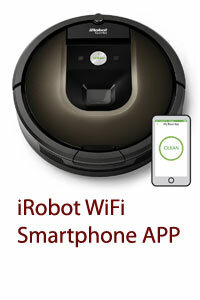 Built-in WiFi & Smartphone APP to program and control your robot vacuum. Its optical sensors detect dirty areas and its acoustic sensors will determine where the dirt is and concentrate on those areas. The HEPA filter will keep the air clean as it vacuums, which is best for those with pets and/or allergies. This is one of iRobot’s best models. The iRobot 960 model has 7 day scheduling, to clean while you are away. This model won our BEST of 2017 Award. Prices of this model have dropped recently, making it a best buy.